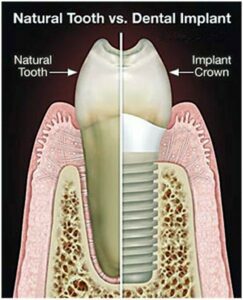 A dental implant replaces the root or roots of a tooth. Like tooth roots, dental implants are secured in the jawbone, are not visible once surgically placed and secure crowns (the parts of teeth seen in the mouth), bridgework or dentures by a variety of means. They are made of titanium, a lightweight, strong and biocompatible metal, that is not rejected by the body. Titanium and titanium alloys are the most widely used metals in both dental and other bone implants, such as orthopedic joint replacements. Dental implants have the highest success rate of any implanted surgical device. Titanium’s special property of fusing to bone, called osseointegration (“osseo” – bone; “integration” – fusion or joining with), is the biological basis of dental implant success. That’s because when teeth are lost, the bone that supported those teeth is lost too. Placing dental implants stabilizes bone, preventing its loss. Along with replacing lost teeth, implants help maintain the jawbone’s shape and density. Implants also support the facial skeleton and, indirectly, the soft tissue structures gum tissues, cheeks and lips. Dental implants help you eat, chew, smile, talk and look completely natural. This functionality imparts social, psychological and physical well-being. Mini dental implants are a fairly recent development as an alternative to bridges or to stabilize partials and dentures. Implants are synthetic structures, placed in the area of the tooth normally occupied by the root, anchoring the replacement to the bone, just like your real teeth. Dental implants are anchored to the jawbone or metal framework on the bone and act as a foundation for a partial or a denture. In some cases, implants can be used to attach dentures. They can actually prevent bone loss suffered by denture wearers so your facial appearance doesn’t alter over time. These tooth replacements are so well-designed; they mimic the look and feel of natural teeth. The posts are usually made of titanium, an immensely strong and medically inert material. In general, good candidates can expect high success rates with the procedure. However, not everyone is a candidate for an implant. For a successful implant to take hold, a candidate must have proper bone density and have a strong immune system. To find out if you’re a good candidate for dental implants, you should discuss them thoroughly with Dr. Shamblott during your free initial examination which includes free X-rays (panoramic and bitewing). Don’t delay maintaining your oral health; It’s just too important. Call our office at (952) 935-5599 and schedule your free initial examination and x-ray consultation.